Now that it’s mid-February, I’m sure most of us are sick of the dreary winter weather and are anxiously awaiting the arrival of spring. However, there is one good thing about this time of year: winter clothes, shoes, and accessories are on sale! Take this week’s Fabulous Find, for instance. We found a pair of camel-colored ankle booties (from Walmart, of all places!) that have been marked down to a mere $15. These neutral boots are not only perfect for winter, but can also be worn during early spring, which makes them well worth the money. 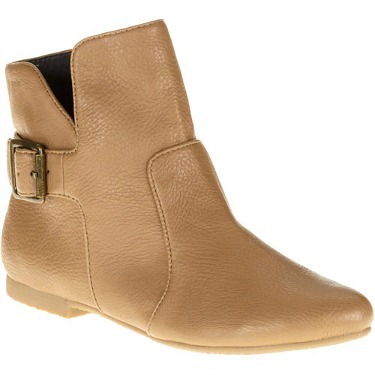 Flat booties are such a fantastic option for class, since they’re on-trend, but also super-comfortable. For a causal and campus-appropriate outfit, wear your favorite pair of dark wash jeans with a neutral sweater. A plaid scarf infuses some print into the ensemble and also picks up on the camel color of the boots. Accessorize with a pair of subtle stud earrings, then stash all your belongings in a structured satchel. For a stylish and colorful look, try pairing our Fab Find with these coral pink cords. The cords will keep you ultra-warm and are also perfect for showing of those ankle booties. Add a blue-and-white striped shirt, then grab a khaki utility jacket. Lastly, add another dose of color by accessorizing with this jeweled cuff bracelet. Once warmer weather hits, try out this adorable getup. Start with a floral print dress, then layer on a denim jacket and the ankle boots to make it work for early spring. Continue the sweet and girly vibe by accessorizing with a beaded headband and layered necklace. For the finishing touch, paint your nails a pretty pale pink shade. What do you think of this week’s Fabulous Find? Would you buy these Walmart boots? Which look is your favorite? How would you wear these ankle booties? Remember to leave a comment below and tell us what you think! Next Sponsored: Win a $300 Prize Pack from CF & Luvocracy!